My birthday is today and I'm turning the big 3-5. To be honest, my thirties have felt pretty good overall, but when I realized this year is 35 I panicked a bit. I’m not sure why, because I’m enjoying this season of life SO much. Self-reflection is always a good idea, and I tend to do it more around my birthday. 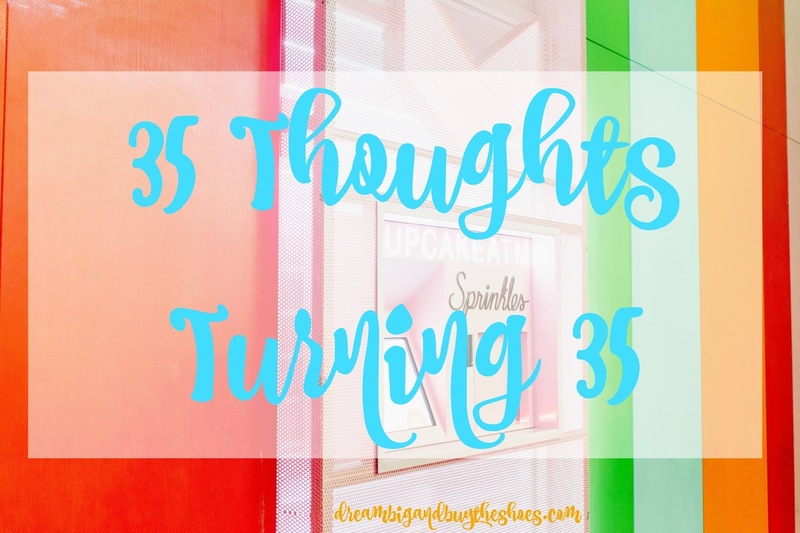 So today I'm sharing 35 thoughts, tidbits, things I've learned or need to learn in honor of my birthday. 1. Quiet time is always appreciated. 2. The little things in life are actually the big things. Enjoy every moment. 3. I'm still really bad at painting my right hand fingernails with my left hand- will I ever get better at this? 4. No matter how tired you are before bed, always take the time to take off your makeup. 5. Tell the ones you love how much they mean to you when you're feeling it. 6. Babies are the ultimate blessing. There's nothing like baby snuggles. 7. I'm still mad about the time I lost the 8th grade spelling bee and will never misspell hors d'oeuvres again. 8. You can never have too many black dresses. 9. You need to love yourself first. And you are worth it. 10. Spend the money. Do the things. Do what makes you happy even if it leaves you broke once in a while. 11. Always dance, even if people are watching. 12. Be the bigger person. 13. Enjoy experiences, not things. 15. Share your experiences to help others. 17. Apologize when you are wrong. It's okay to accept your mistakes and learn from them. 18. Find a hobby that makes you happy....this is mine ;) . 19. Find a signature lip color and own it. Rock that lippie all the time. 21. You can never watch Home Alone too many times. 22. Lightning bugs are cool at any age. 23. The sky is amazing and can change your day around. 24. Don't scrunch your face up in the sun. 26. Sunday breakfast is the best meal of the week. 27. Don't believe everything you read on the Internet. 29. You are stronger thank you think you are. 30. Everyone should see Britney in concert at least once, if not 6 times. 31. Distance makes you appreciate people even more. 32. It's okay to have a bad day. 33. Pittsburgh is the best city in the world. 34. Life is really crazy, and insanely beautiful....really, REALLY amazing. 35. Dream BIG. Buy the Shoes. This year for my birthday, I am asking for donations to Grady's Decision. There aren't enough words to properly describe or thank this group that helped us so much during my bedrest and pregnancy and Bella's NICU adventure. You can read more about how they helped our family here & donate through my birthday fundraiser here. The fundraiser is ran through Facebook, but I read that you don't have to have Facebook to check it out and Facebook does not take any part of the donation- 100% goes to the charity. Thanks for reading, and spending time here on my birthday. I appreciate you all for your loyalty, love and friendship. Have the best weekend, xo!